Sanral says it is "disconcerting" that road users are being encouraged by Outa to break the law. The Organisation Undoing Tax Abuse (Outa) has accused the South African National Roads Agency (Sanral) of being in breach of the code of conduct of the Debt Collectors Act due to the "misrepresentation" of employees working in its call centre. Outa says "after receiving whistle-blower information and doing an investigation" it has uncovered that the phone number on Sanral's less60 Web site, along with the number appearing on SMSes sent to motorists, is being rerouted to a private collection agency, ITC Business Administrators. Outa is up in arms as it says the employees working for ITC Business Administrators "appear to have been instructed to misrepresent the nature of their employment". However, Electronic Toll Collection (ETC), the company responsible for collecting e-toll payments, told ITWeb that protests about what it calls the "employment of experts" to collect outstanding debts "carry no weight". ETC confirms ITC Business Administrators has been contracted "to provide outsourced additional resource infrastructure" to support the debt recovery exercise. "It is generally standard practice of an outsourced arrangement to represent the client," says ETC COO Mark Ridgway. This after Outa's director of legal affairs, Ivan Herselman, accused Sanral of being in contravention of rule 5.3(b) of the Debt Collectors Act: Code of Conduct which reads: "In collecting or attempting to collect a claim, a debt collector shall not misrepresent the true nature of his or her business, or threaten to institute legal proceedings, whether civil or criminal, if there is no intention to carry out such a threat." Outa alleges misrepresentation based on the fact that the call centre agents it spoke to indicated they are employed by Sanral, when in fact they are employed by ITC Business Administrators. ETC, however, has dismissed Outa's protests as "bluster". "Any reference to misrepresentation is obtuse and the collection of these outstanding monies has merely entered the next phase in accordance with the current laws of South Africa," says Ridgway. "Continued distortion of the true facts and bluster by entities purporting to be all knowing is starting to wear thin," he adds. Outa also alleges Sanral is in breach of the same Act for sending out SMSes to motorists telling them that legal action "will" be taken if bills are not paid. "Unless Sanral are prepared to follow through with this threat, they may not send these messages," adds Herselman. The SMSes read: "We have noted your refusal to pay your outstanding e-toll balance. Your vehicle details are being submitted for listing, and legal action will commence with costs incurred." However, Vusi Mona, Sanral's general manager of communications, sounds very serious about the enforcement of SMS threats despite what has been said by "e-toll detractors". "The debt collection process will continue, after which various law enforcement actions are available in terms of Sanral and Aarto [Administrative Adjudication of Road Traffic Offences] legislation," says Mona. ETC agrees non-paying road users "will be subjected to ongoing collection activity, listing of their vehicles and civil action". "There should be no misunderstanding around these possible consequences." Mona adds it is "disconcerting to note that road users are encouraged by Outa to break the law". This as Outa says "the public need not fear these intimidating messages" as it believes there is no legal basis for enforcing the debt. 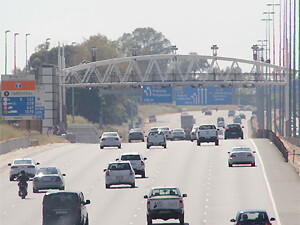 "Road users should weigh up the risk of dealing with the consequences of the non-payment of toll versus accepting the opinion of e-toll detractors who admit on their Web site that being a member 'is not a guarantee of representation' and that they are 'not a law firm or a body of lawyers'," concludes Mona.